Aesthetic Dental is the only dental surgery in Hawke’s Bay pleased to be able to offer the latest the world has to offer in Computer CEREC CADCAM technology to help restore teeth and smiles. Utilising highly powered computer software and hardware you can now have broken or discoloured teeth restored back to new the same day. This means no temporary restorations to fall off, better fitting restorations, less sensitive teeth and no two week waiting time. This really is dentistry of the future! 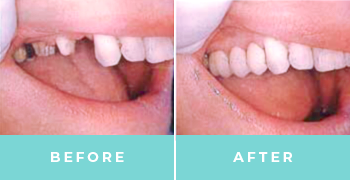 Bridges can be used to replace one or more missing teeth by using the teeth on either side of the space as anchors. If the missing teeth are not replaced the remaining teeth can move causing a bad bite, sore jaw or gum disease. These can be used in most situations to replace old dark amalgam (silver) fillings. These are always used on front teeth and where appropriate on back teeth. Crowns or ‘caps’ are used to cover damaged, discoloured, heavily filled or root canal treated teeth. They strengthen and protect the remaining tooth to prevent cracks or breaks, which may result in extraction. 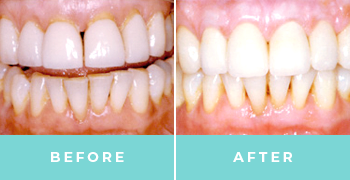 They can also be used to dramatically improve the appearance of unsightly or uneven teeth. With our expert knowledge you can have the smile of your dreams. With any combination of tooth whitening, veneers, dental implants or bridge work, we can create a beautiful aesthetically pleasing smile to be proud of. 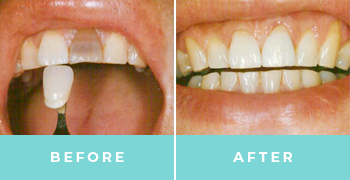 We can create a ‘copy’ of your new smile from a white plastic model to superimpose on your teeth and give you a vision of what your new smile would look like. 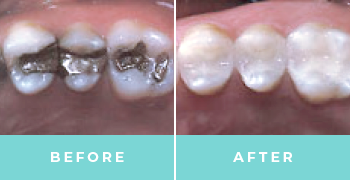 We utilise a home system where a mould of your teeth is taken at the clinic and a tray is made specifically for you. 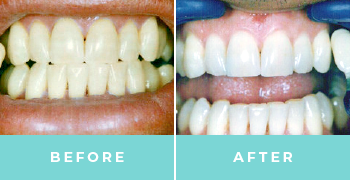 This tray is then lined with the whitening gel and worn overnight for at least 5-7 nights. We record the color of your teeth before and after treatment and you keep these trays for life. A ‘top up’ of 1-2 nights may be required every 18-24 months to maintain a natural white smile. These are an excellent way to create a beautiful smile by closing spaces between teeth, repairing broken or chipped teeth or covering stained, discoloured or cracked teeth. 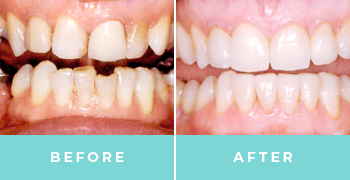 Veneers require either no or minimal tooth preparation and they provide an extremely life like cosmetic result.